Esencia offers you Plots, independent Floors, Villas - Homes where you can sense pleasure, peace and the delight of green and comfortable surrounding with exclusive feature. Alba Floors at Esencia offers you independent Floors, Homes where you can sense pleasure, peace and the delight of green and comfortable surrounding with some of the exclusive features like Air conditioners of BEE Rating 1.5KV in Living room and 1KV in Bedrooms, Bedroom with Complete Wood work, Landscaped Garden on Terrace and a lot of other features and admirable amenities. Floors at Esencia are available in only 3BR size, which in itself is a mark of stylish luxury independent floors. 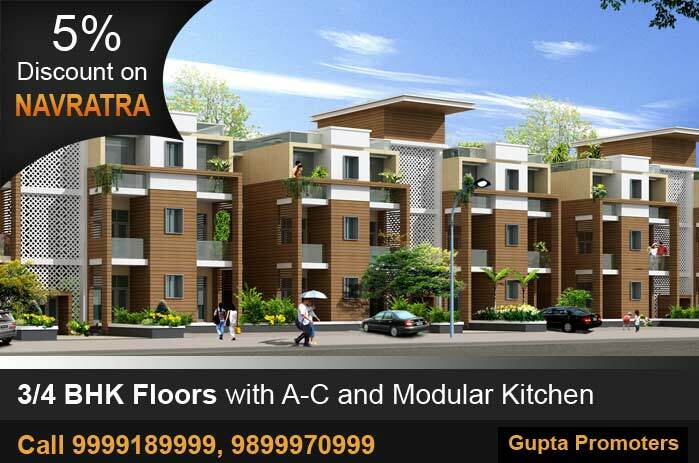 · Located in Premium Sector 67 Gurgaon. · Built on a plot area of 251 sq.yds. · Option of Ground , First & Second Floor. · Landscaped Garden on the Terrace. · Airconditioned Floors with 6 KVA power back. · Fitted with Modular Kitchen , Chimney & Hob. · Almirahs in all Bedrooms. · Bathrooms fitted with Gysers , Exhaust & Glass Partition. · Video phones on Main door & Sensor lights in living room. Esencia has a lifestyle for everyone who wants to be a part of this Green evolution. All the apartments within the mid segment Sovereign Floors and the large duplex Royal Floors shall incorporate the recommendations from ADaRSH and will have been rated under GRIHA. For those who are looking for an independent floor apartments, the homes at Alba South is just what the doctor ordered. With a heavy emphasis on green living and use of renewable sources of energy, the enviable facilities and the various green zones, Esencia is the right place to bring up your children. Rest assured, you shall be residing in the greenest apartments in the NCR. Named after a beautifully sculptured ornamental tree with narrow elongated green leaves found abundantly in this part of the township, Alba with its abundant greenery is ideal for your dream home. You can chose from a wide variety of housing options from Soveriegn Floor Homes measuring 210 sqm to Plots measuring from 210 to 250 sqm. Along with the abundance of green spaces like Hyde Park, Eco Grove and Tranquil Grove , Alba is also equipped with important amenities like a Creche, Nursery School and Primary school along with place allocated for a religious building. Imagine living in the Garden of Eden. Being surrounded by the bounties of nature that cocoon you in its beauty. Imagine living in a self contained oasis, where you're a part of a beautiful palette of colours, textures and sounds. Where you experience a sense of peace and contentment, secure in the knowledge that you're a part of something special. Alba will be an enclave within an enclave, a microcosm of the green township of Esencia with homes as beautiful inside as the view outside. Alba shall have beautifully designed airy, sunlit apartments with each having a modular kitchen, a chimney with exaust and sensor controlled lighting in every living room. Each apartment will also have geysers and exausts along with a 6KVA power backup. 7B, Level Ground, Netaji Subhash Marg, New Delhi.